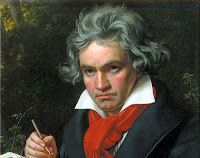 For me, the greatest piece of music ever composed was Beethoven's 9th Symphony. My wife must agree, because whenever she's feeling especially optimistic and productive, she hums the "Ode to Joy" to herself. A friend sent me this wonderful high-definition video, which features the music. The event was recorded at the Placa de Sant Roc, in Sabadell, a town about 15 miles up the coast from Barcelona, Spain. More than any music I've ever heard, it expresses convincingly the power of the human spirit to strive and prevail. I love it! Watch it, and you'll see what I mean. Now I know where to go when my spirits need an uplift. I hope it inspires you, too, to do the hard things that life will always ask of you.